Self-catering accommodation offering the discerning budget traveller a comfortable and sociable stay. 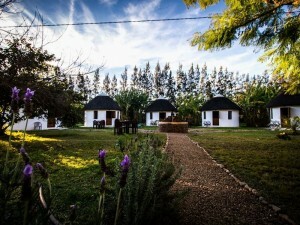 Stay in our en-suite rooms in the main house or our traditional thatched en-suite rondawels or dorm rooms. Relax in our stylish lounge or enjoy refreshments on our deck outside. Prepare your meals in the well-equipped communal kitchen or enjoy our outdoor braai facilities. Anna Reitz, South Africa:We very much enjoyed our brief stay at the Aardvark in December 2014. Our hosts were very welcoming and helpful – they even brought out big chalks for our grand-daughters to draw on the paved path on our last day! Charming and interesting décor. Joe Marth, South Africa: Great place and good service.